Pets are not allowed on your trampoline! 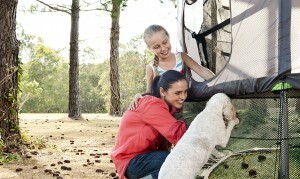 Our pets are often considered to be a part of the family, just like your human family members. But, even though your dog or cat goes everywhere you do and eats at the table, the trampoline isn't a great place for them to be. Why are pets such a bad idea on the trampoline? Your pets claws and teeth may cause a weaking in the jump mat material. A torn jump mat could then lead to jumper injury. Fortunately, if this does occur, Vuly offers half price trampoline parts for life. Pets may wander underneath the jump mat while the trampoline is in use. Sadly, there have been cases that have seen a distracted pet become injured by a person jumping above. Don't let this happen to your pet --- if you love them, protect them from harm! Teach pets that the trampoline area is off-limits to them. If necessary, leave them in a contained area (house, kennel, etc) while the trampoline is in use. Teach jumpers to never encourage their pets to join them in the fun. Remember, the safety of all involved is at stake. Invest in a Vuly trampoline skirt to prevent pets from being able to go underneath the trampoline and stop them from climbing up the net poles.